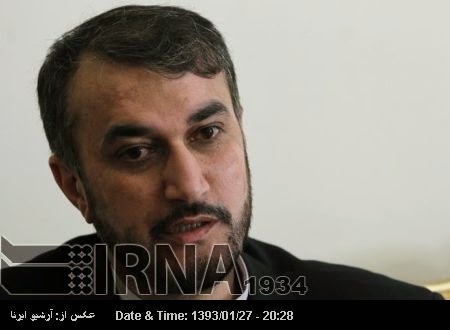 Tehran, IRNA – Deputy Foreign Minister for Arab-African Affairs Hossein Amir-Abdollahian said in a meeting with the Burundi President special envoys on Wednesday that Iran is willing to develop relations with the African states. Burundi Presidentˈs special envoys Sharif Majid Abdulrahman and Leonard Komana submitted Burundi Presidentˈs message to Iran President Hassan Rouhani. Amir-Abdollahian underlined significance of the Iranian relations with the African states and constant follow-up of the agreements already reached between the two countries. Amir-Abdollahian emphasized importance of dialogue and consultation between the two countriesˈ officials on key regional and international issues. The Iranian and Burundi officials reviewed latest developments in the Central African Republic, the role of the governments of Burundi and other African countries to guarantee security of the peacekeeping forces in the Central African Republic. Muslims have been exposed to massacre and bloodshed in the Central African Republic due to ethnic violence and unjust enmity with the Muslim population of the Republic. The United Nations deployed peacekeeping forces to stop violence against the Muslims in the Central African Republic.